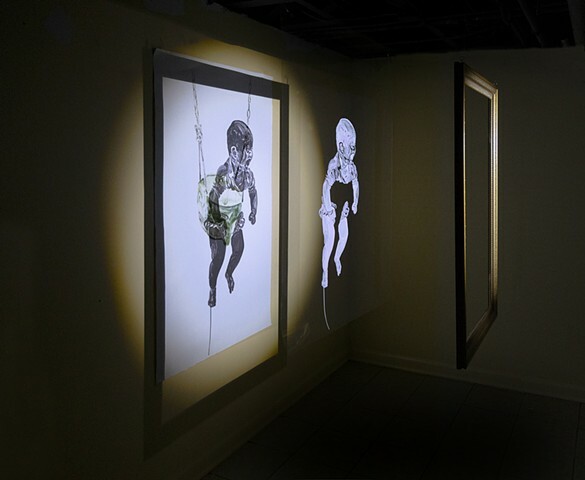 These installations of light, shadow and paint create haunting images of children in order to evoke emotional responses on a gut level. Delicate constructions that attempt to capture the impermanence of childhood as a whole and specifically the impermanence of one particular child in my life. 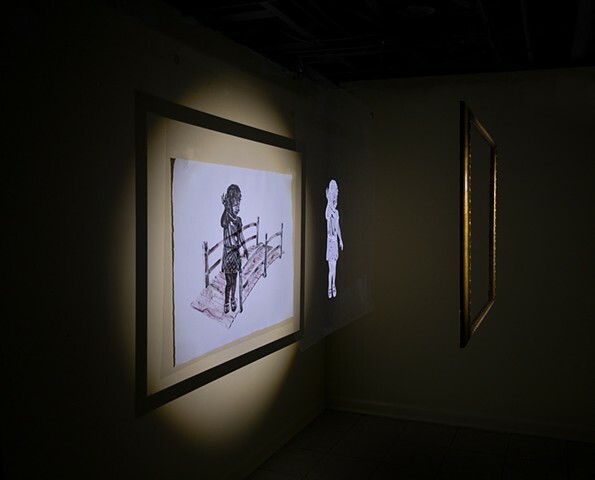 I am creating a three-dimensional space in which the viewer can experience the image of a childhood object like a playground swing, a stroller or a wagon created through a watercolor monotype process that softens the images and helps to place them in a realm of memory. 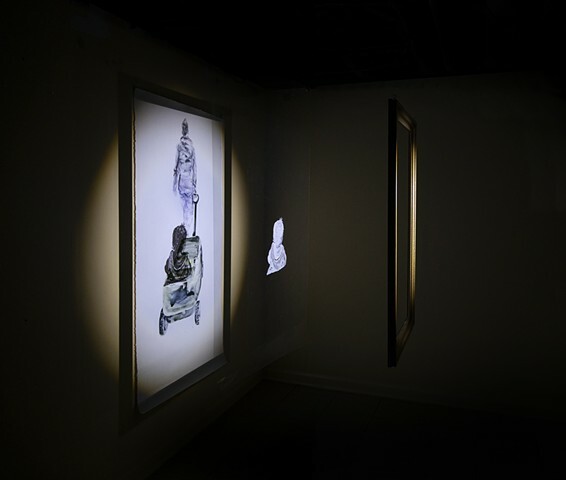 Hanging several feet in front of the images (suspended by filament from the ceiling) are empty gold-gilt traditional frames, just floating in mid-air — seemingly weightless — attempting to frame the image of the paper on the wall...but as the viewer moves around the piece, the frame no longer visually contains the image. 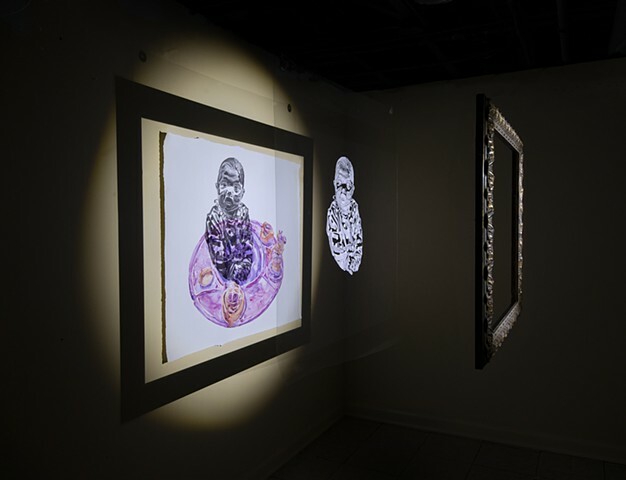 In between the empty frame and the paper on the wall hangs a sheet of clear Mylar with an image of an infant or toddler painted in soft white and pink tones—barely visible at first sight and again suspended in mid-air with an ethereal floating quality. 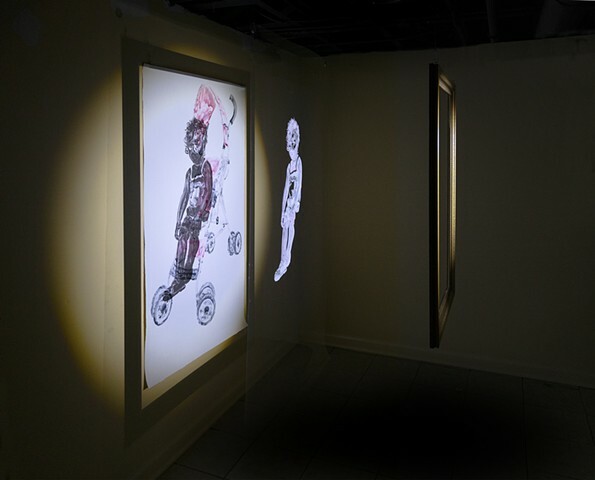 Then as the viewer moves through the exhibit, spotlights directed at each work will slowly dim up and down revealing a strong shadow of the infant/toddler appearing in soft grays (and with surprising detail) onto the images of empty objects on the wall. Strong theatrical shadows of the heavy frames are cast on to the wall as well, creating a mini stage like environment for each piece.